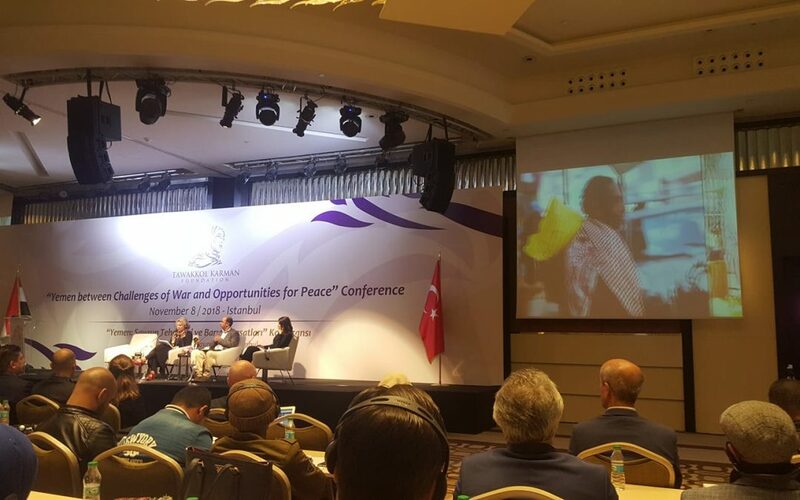 The Tawakkol Karman Foundation has organized an international conference, “Yemen: War Challenges and Peace Opportunities”, which will be held tomorrow in Istanbul city in Turkey. The conference has shed light on the subject of Yemen and international responsibility towards it and devised recommendations for a process for lasting peace, according to the executive director of the foundation. The participants at the Istanbul Conference on Yemen, “Yemen: War Challenges and Peace Opportunities”, convened in Istanbul on Thursday, 8 November 2018. They call for deliberate and responsible actions to end the war and restore peace in Yemen, and to preserve Yemen’s security and sovereignty, in accordance with the content of the Comprehensive National Dialogue Conference document, the Security Council resolutions, and the GCC Initiative. First; Respect for Yemeni Sovereignty: whereby the proposed solutions should not impact Yemen sovereignty and independence, including not legalizing any illegal acts that have occurred during the war. This principle requires that the Yemeni authorities function from within the Yemeni territories.It also calls for enabling the legitimate authority to restore control over ports, economic resources, and military and security forces. Second; Support the Yemeni State: the participants at the conference believe that the Yemeni state is the guarantor of security and stability and that chaos, war and the spread of armed militia are the natural consequences of state absence.Therefore, no armed or unarmed group working against the state should be allowed to exist or be legalized. Within this context, the post-war state shall not be subjected to any form of compromise whatsoever and shall ensure the principles of a republic: democracy, equal citizenship and human rights. Third; Do Not Forsake Justice : the participants advocate for the establishment of an international court on Yemen, to consider all crimes committed by the local and international parties to the conflict. Fourth; Improve the Humanitarian Situation: this shall include an immediate lift on the blockade of Yemeni ports and airports, and an end to the blockade on Taiz governorate, the largest governorate with respect to population. To prevent a humanitarian disaster in Hodiedah city, exert all efforts to improve the health situation, electricity supplies, and provide salaries according to the official payroll list of public servants before the 21st September 2014 coup. It shall also include the immediate release of all political detainees who have been detained in relation to the ongoing war since March 2015 without any charges. – A referendum on the draft constitution and organize public elections: to start the preparations for the constitutional referendum, as agreed by Yemeni parties, and to hold the presidential and parliamentary elections, under UN supervision to ensure a peaceful and legitimate power transition. – Commit to a reconstruction project: within this context, the countries involved in the conflict, in addition to friendly states, shall undertake all necessary steps to assist Yemen in the reconstruction process. – Keep the situation in Yemen under international observation: the participants recommend to keep Yemen under international observation until the public elections have been organized, according to the new constitution. The international community shall also help Yemenis to overcome the consequences of war in the future.